It was the first English bible that I know of to include both the Septuagint and the New Testament. Late last year, I received the New English Translation the Septuagint, but alas, it was difficult to carry two bibles to Church, so when I heard of this one coming out, I was excited, and I have not been disappointed. Not only did it have the distinction of having both (Greek) testaments in one bible, but it included the Deuterocanon along with notes that introduces people to various ‘Church Fathers’ up till the Great Schism. Plus, unlike the NETS, the OSB is publicly readable. For the Septuagint, the Committee used Rahlfs critical edition of the Greek text, which is what the NETS used, however, they further used Brenton’s 1851 translation and the New King James Translation as a backdrop. They readily used the NKJV in places where the Hebrew and the Greek matched. They did, however, use the canonical order (which is a reminder that the order of the canon varies from Tradition to Tradition, time to time, and even Faith to Faith) of the Old Testament According to the Seventy, first published in 1928. Of course, using the Septuagint creates problems for those who have constantly read the English translation of the Hebrew, especially in the Psalms and Jeremiah. The inclusion of the Deuterocanon (which foreign only to Protestants after 1830) does not include, as the NETS does, the Psalms of Solomon which is actually reference/contained the Codex Alexandrinus. While I am not here to debate the canonicity of certain books, it would have been nice to have that book included in this Translation. The Deuterocanon, unlike other bible versions, are printed in the canonical order. Where as the King James Version (KJV) places them in a separate section between the two Testaments (giving the reader the notion that somehow the First Covenant ended, people wrote a lot of books and the the Second Convenant began with Matthew). The New Testament is taken from the New King James Version (NKJV), although like other NKJV’s, the variant readings are listing in the footnotes. I have no real issue here, believing that this will help others to actually buy the bible and give it a fair shake. For me, it allows me to keep the bible in hand during service instead of switching to my Cambridge for the New Testament. This also provides a measure of consistency in quotations between the Old and New, now that the Septuagint is in English along side the New Testament. Many bible students know that the Septuagint was the bible of the Apostles and the primitive Church. The Committee also offers a general overview of the books as well as an introduction to the Orthodox Church. 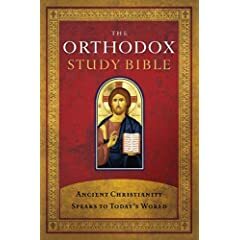 I am not going to provide an answer to their assumption of continuation from the Apostles and Acts, but it is nice to have within this bible brief doctrines and explanations of the Orthodox Church. In there Introduction, the speak about Doctrine, Worship, Government, the disagreements between the West and the East, the Great Schism, Further Divisions and the modern Orthodox Church. This is not a slight against the Committee, but the history provided in these sections is often shallow and muddy; however, it is not the Committee’s mission to provide Doctoral Thesis of Orthodox History, merely to perk the interest of the reader. And in this mission, it this Bible serves well. The book overviews and easy enough to follow, again, not giving deep insight, but pointing to the Traditions positions on the book. As with any Study Bible, the OSB have footnotes throughout, but more often than not, it refers to an ancient writer, such as John Chrysostom or Vincent of Lerins, and many others. This serves the purpose well of pointing to a long history of the Orthodox, filled with commentators on every subject and every book. Of course, like all other denominationally based Study Bibles, the doctrines of the Orthodox Church is held up throughout. From the very beginning, the Trinity is pointed out. (Although, dear readers, you know that I would disagree with that position). Interspersed throughout the translation are introduction to specific doctrines as held by the Orthodox Church. Of those doctrines that Protestants have a difficult time understanding, myself included, is Deification. According to many fundamentalist apologist, Orthodox Deification is the process of becoming a god. Instead, the OSB says that it the process of Christians becoming more like God, or as Peter says in 1.3, partaking in the divine nature. Although I am not incomplete agreement with the terminology, I can understand that idea of a progression of the Christian to become more holy. This is just one example of the many areas in which the Study Bible serves to create a communication bridge with the Orthodox Church world. One the things that I do not like is the quality of the bible. I am pretty rough with mine, because it gets a lot of use. I am almost afraid to touch the pages as they are extremely thin. Another thing is the lack of cross references. I don’t really use them, but I do know of more than a few that do. This bible does not have any. Overall, the OSB serves as a sturdy companion to myself. I appreciate the fact that finally I have a compete Greek to English Bible with the Deuterocanon as well as insights into minds 1000 years ago. I agree with you about Todd Bentley et al. I run The Governmental Goals of God TV who has you know are in with Bentley e al. Bentley Joyner NAR my blog if you are interested details the horror story unfolding on God TV and its attempts to internationalise and globalise the pernicious doctrines of Joyner. I recently bought the leather-bound version of the OSB. I’m not Orthodox either (though I have attended liturgy a few times). I really appreciate the new Septuagint translation and the Traditions found within the OSB. I currently use it for my private devotional readings following the Daily Office Lectionary. Regarding the Deuterocanon, I find the SAAS version much easier to read than the more popular NRSV. On the notes, I like the Christo-centric approach to many of the OT passages. All in all an excellent Study Bible. I am hesitant about buying leather bound editions of new bibles; I dunno why, maybe because I am still unsure about using them in Church. But I wish I would have on this one. Thanks for the comment. Reply To this comment If you know where I can find this bible here in Montreal.